“Volunteerism is one of the most powerful forces on earth“Colorado based Muscles volunteer, John Marx is quoted in Drake Universities award winning ‘think‘ magazine. 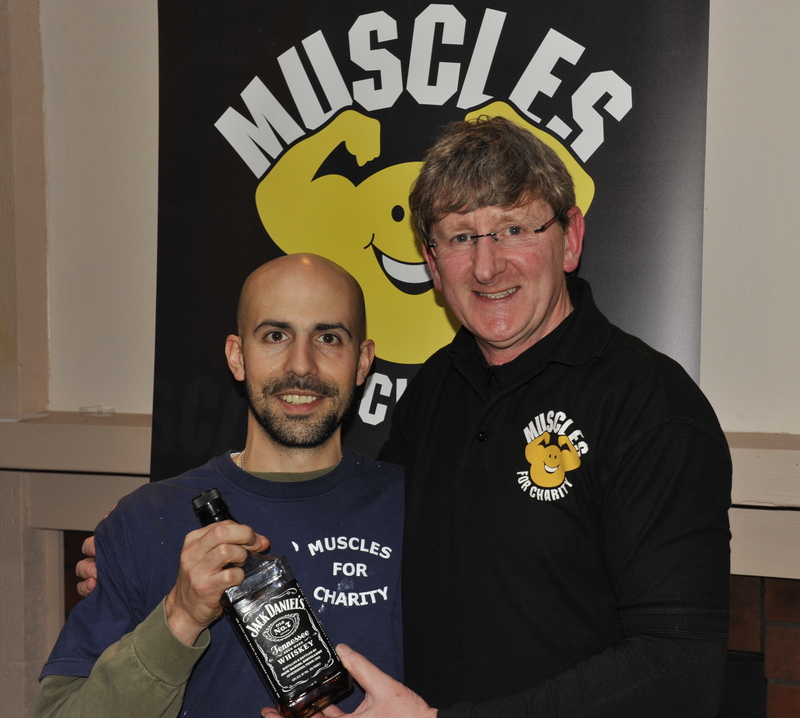 “From pay check to pay it forward“, the 2012 edition highlights Muscles for Charity as part of an article on ‘professionals adapt skills for good’. Visit ‘think’ magazine at http://thinkdubuque.com/virtual.html The article starts on page 32, with ‘from fighting crime to fixing lives‘ on pages 33 – 34. ‘think‘ magazines article coincided with the USA and Canadian teams celebrating the latest Muscles for Charity milestone – 10,000 voluntary hours. 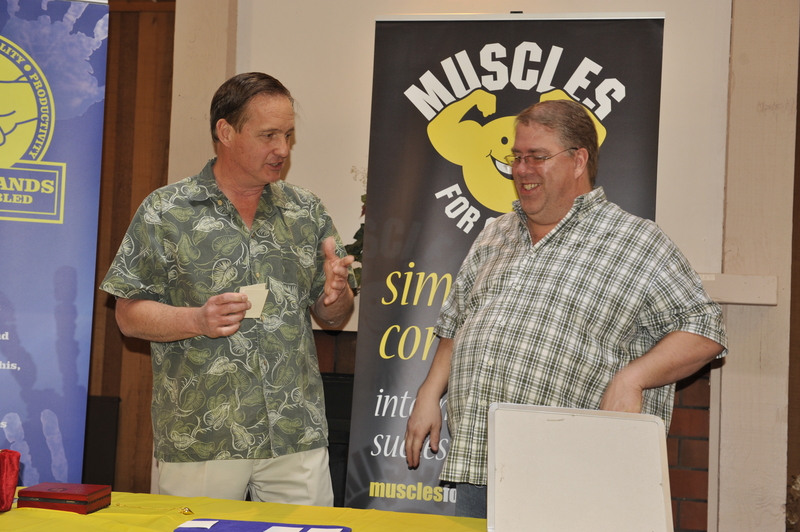 Muscles team members, and local recipients of our services gathered in Bellevue on 17th March 2012. Ody lead the celebration ! 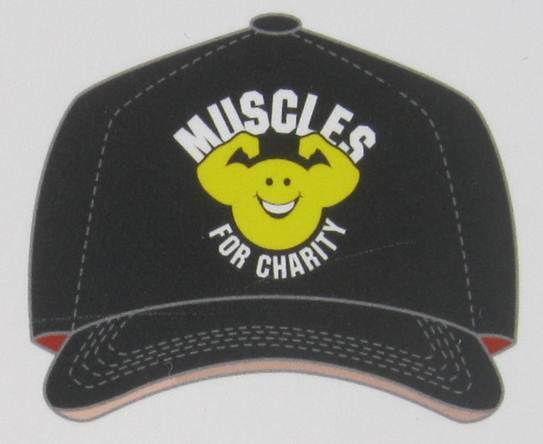 and the introduction of the new Muscles baseball cap. Interested in purchasing the new baseball cap? Its a cool ten bucks ! The Bellevue, WA, home painting project is featured on the ‘Home’ page of this website. 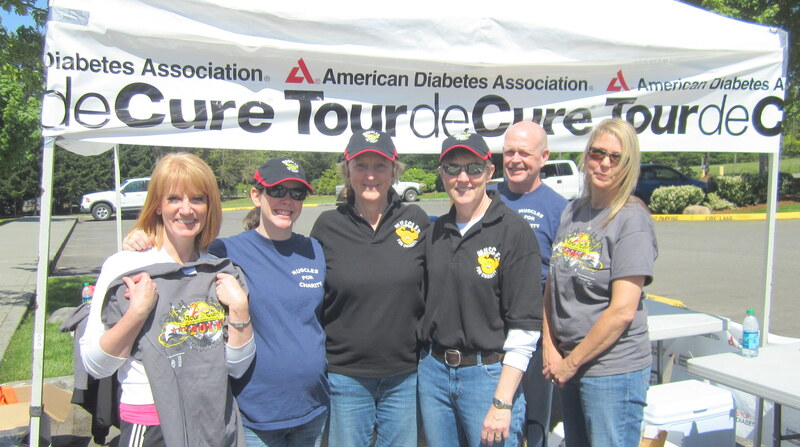 This page features the celebration of 10,000 volunteer hours and exciting new links with ADA ‘2012 Tour de Cure’ in Redmond, WA on Saturday 12th May. 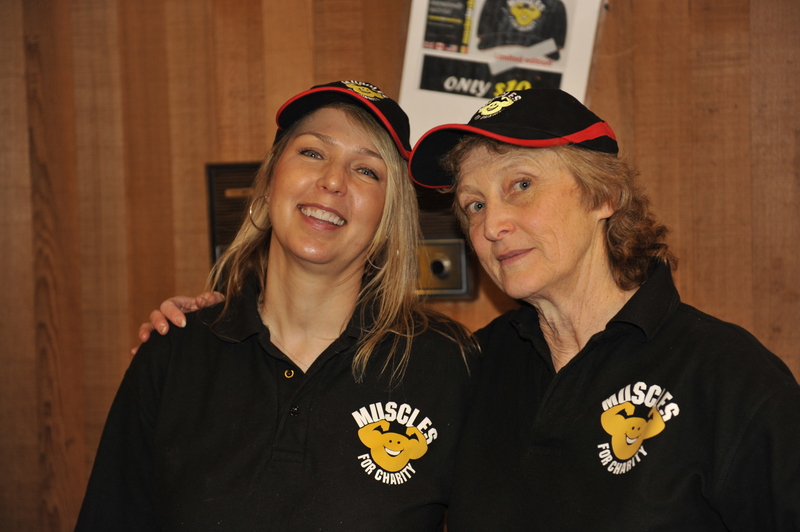 Muscles volunteers have been invited to ‘operate’ a Rest Station as part of the 2012 ADA ‘Tour de Cure’ on Saturday 12th May, in addition to the volunteers who are participating in the charity event. 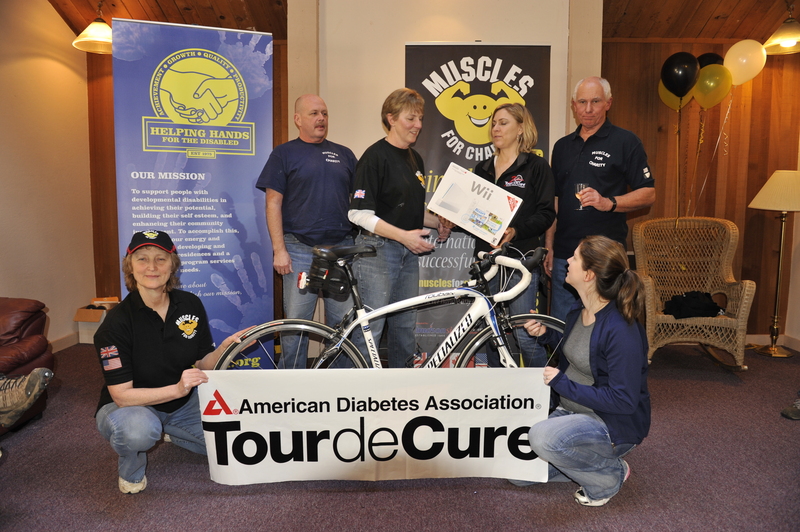 The photos show the Muscles team with ADA Tour Manager, Pamela Forester. 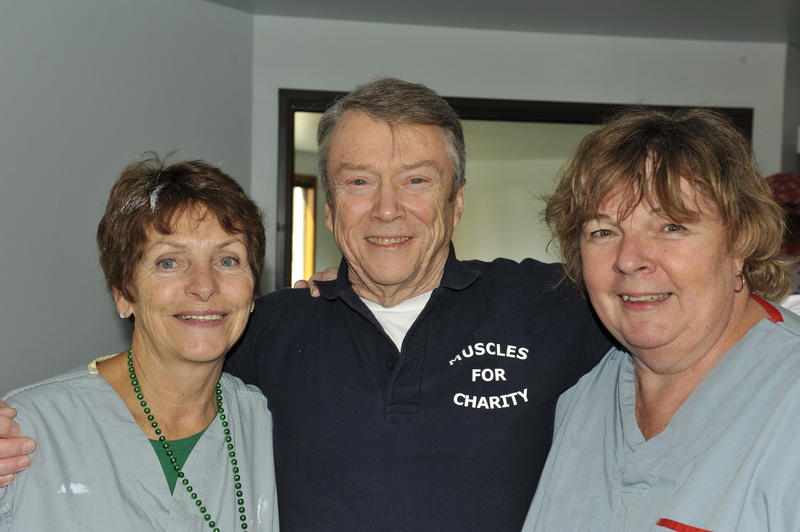 “The visit of the Muscles team has had a huge impact on many lives. I feel very fortunate to be one of those people. There is such love and generosity that is given without condition. And, on the Helping Hands side of this – what can I say? Two houses painted and one with a re-built deck. How many thousands of dollars have been saved so that we can continue to provide excellent care to our residents in safe. fresh and clean environments? You are amazing friends and I thank my lucky stars to have each of you in my life, but also Allisons. 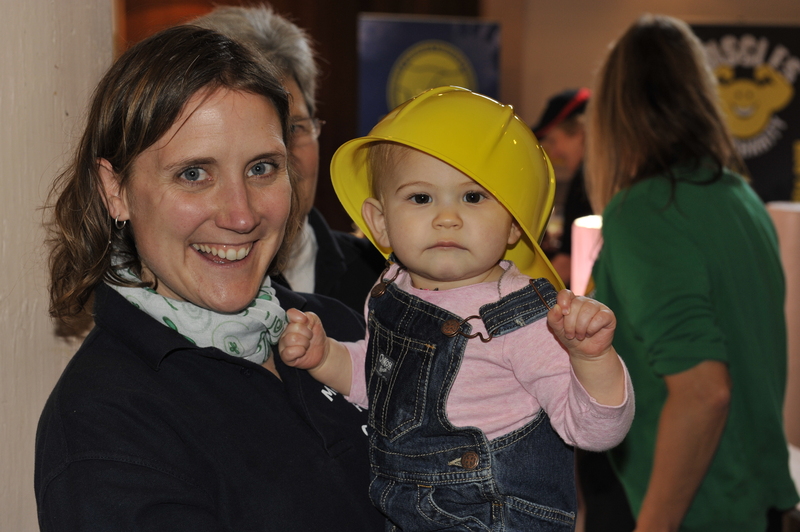 She is going to be a very lucky girl growing up knowing the Muscles team. So from the bottom of my heart, I love you guys. 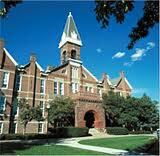 Thank you so much for everything you do and who you are”. 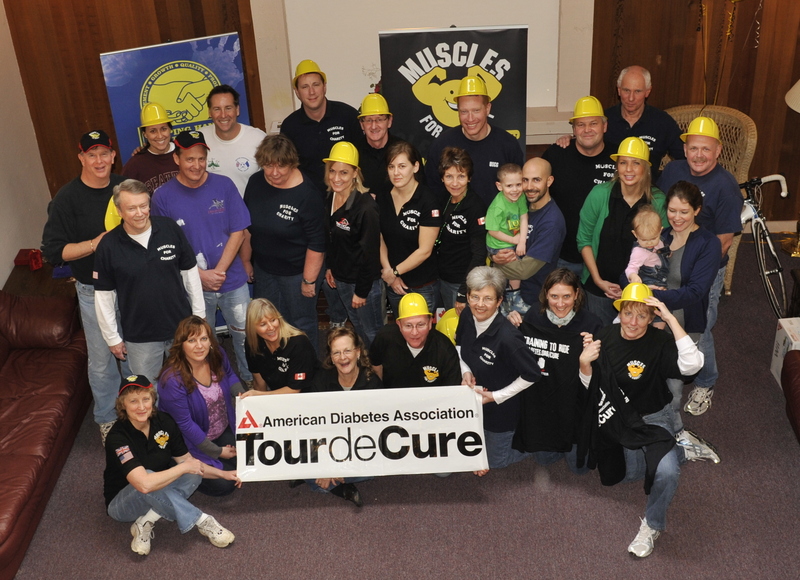 Saturday 12th May – 2012 Tour de Cure – New challenge, new volunteers. 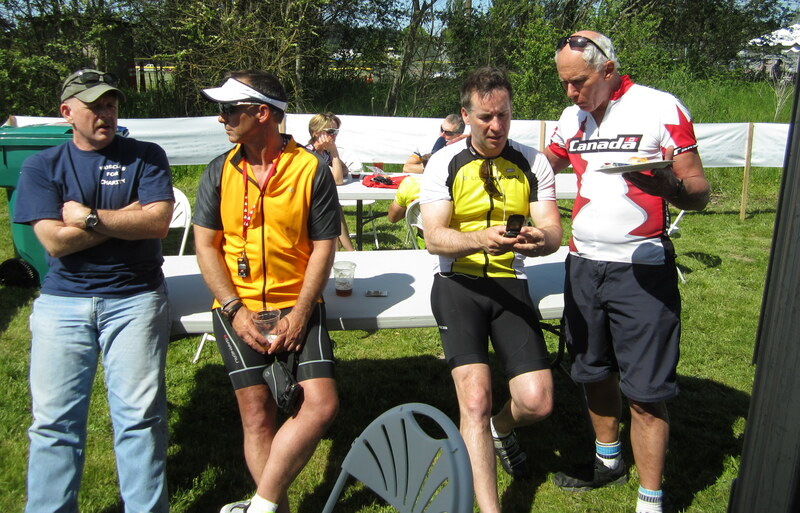 Saturday 12th May was the hottest day of the year (to date) and provided the team with a new challenge – to operate the first (and busiest) Rest Station of the annual Tour De Cure cycle challenge for American Diabetes at Maltby (15 miles from the start in Marymoor Park, Redmond). 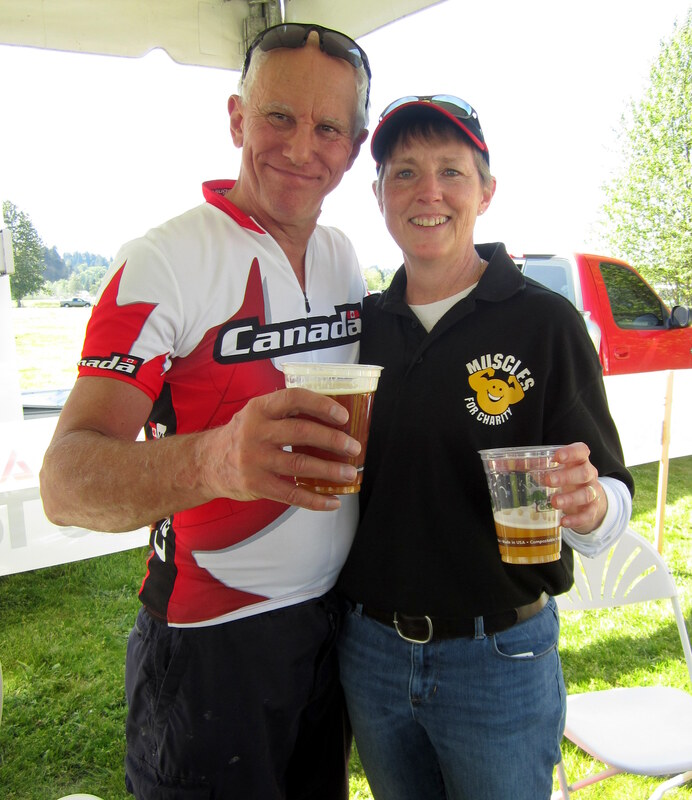 Over one thousand riders, (including Muscles volunteers Frank, Hoby and Bish chose to ride), whilst nine others (Ody, Bill, Glenna, Joie, Amy, Suzanne, Sandy, Michelle and Conie) operated the Rest Station and encouraged the riders. 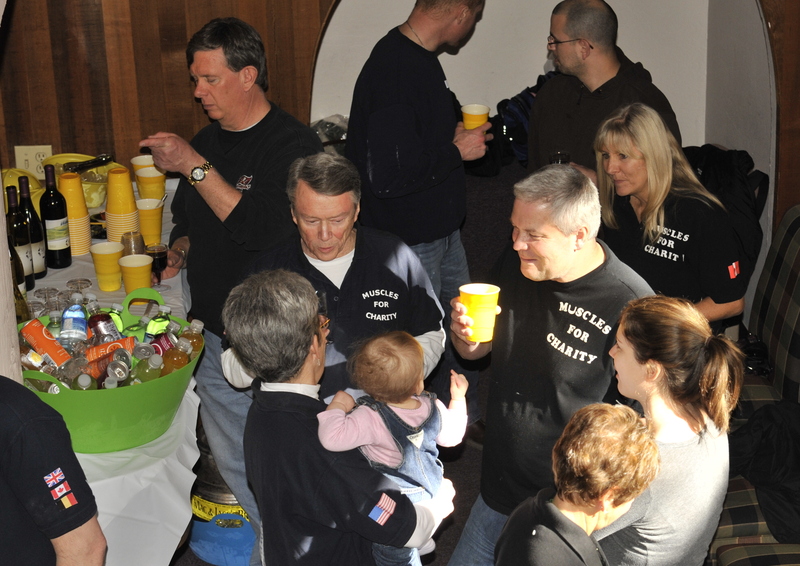 Thanks to everyone, and especially new volunteers – Hoby and Conie Shelton. 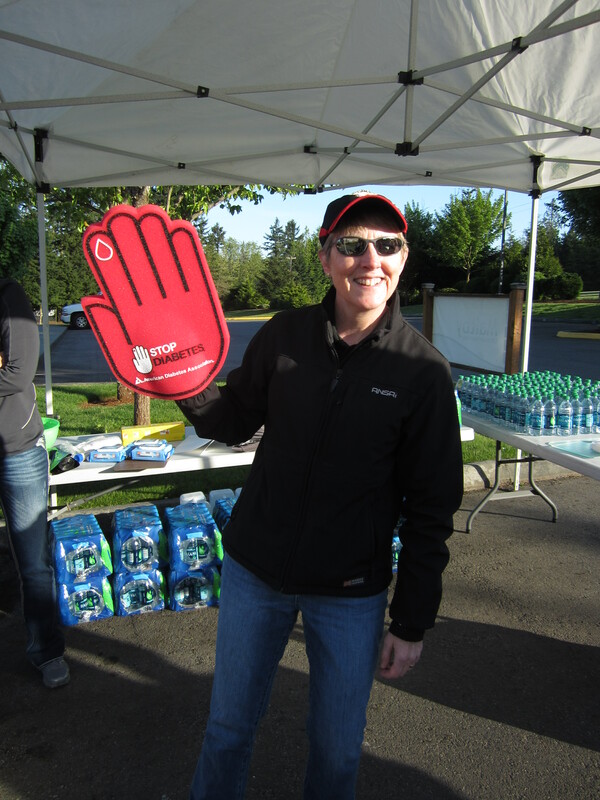 Apolozise to Amy who missed being in the photos, but provided enthusiastic support and encouragement at the Rest Stop. 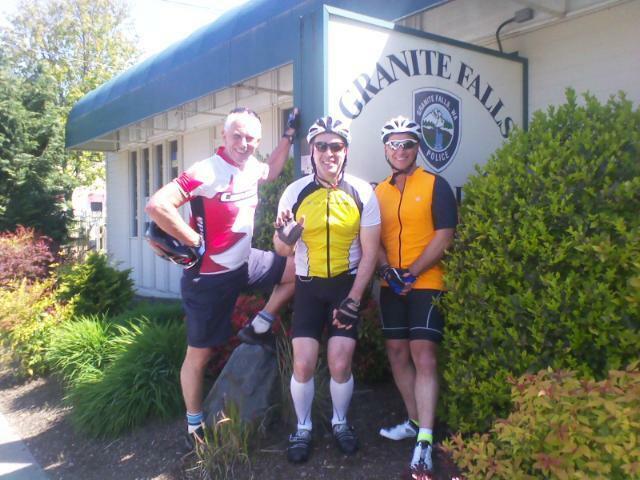 (left to right) Bish, Frank and Hoby at the furthest point of the 100 mile cycle challenge – Granite Falls Police Department, WA. 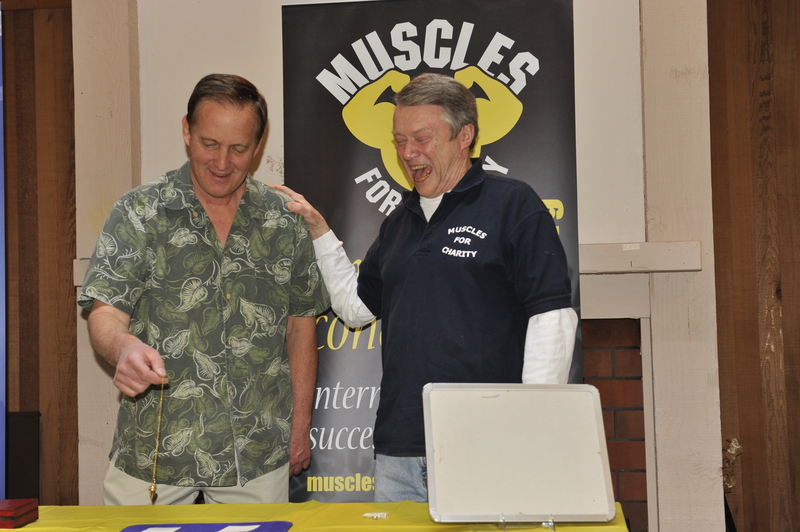 For the seventh consecutive year the Muscles team were invited by Bellevue, WA based registered Charity, Helping Hands for the Disabled to help raise awareness and finance at their annual supper and auction. The team were totally surprised and delighted when their favorite auctioneer, Graham Crow, took a rare evening off and joined the teams table for a rewarding and very enjoyable evening.